I dyno'ed out at 229 hp at the wheels and 185 torque with a Turbo XS intake and a Zex 75 shot, you know what! Fuel air mix is perfect, no problems. Other than that.....all stock and extremely quick, quick, quick. How do I attach my pic of the dyno to post it for all to see? Attached Dyno below. 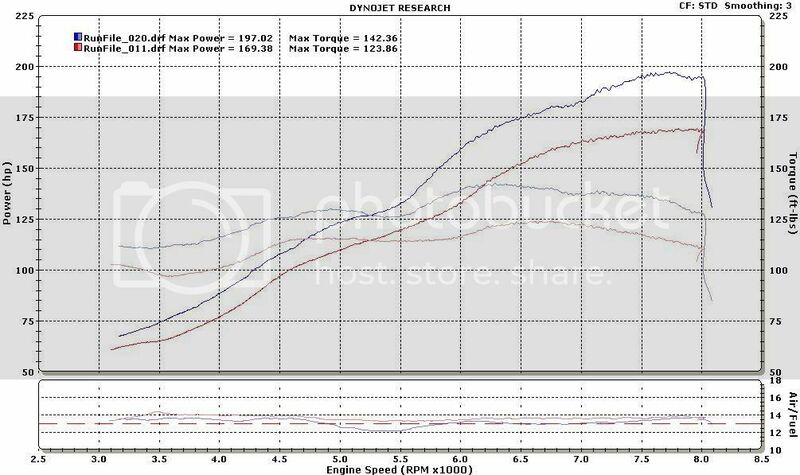 I will get a cd for a clean digital shot of my dyno. 2004/2005 Elise, Sport pkg., Red Lux. pkg., hard top, Exige silver wheels, 175 whp with a TurboXS Intake, and now a Zex Wet 75, Of You Know What!.........Gives Me 229whp and 185 torque to the wheels, with no heat blankets or special anything needed. It lasts a long time with the 75 shot and two or three gears needed here and there. Fuel Air Mix starts around 15 and drops to the 12's all the way to 8200 rpm's...nice and safe. No lag, no bogg, just instant take-off! Here is my dyno set from today. Exige S, Larini Exhaust, Daytona intake, otherwise stock (stock cat). Note the 219 hp at the wheels. Not bad for a car that is supposed to be 220 hp. We also drilled a hole just downstream from the intercooler to measure boost pressure. For some reason, the boost reading was uneven. Not sure about that, but it does look somewhat consistent. I think the average boost reading (using an analog pressure gauge) was about 6.5 psi. Note in the first run, we did not have the boost sensor hooked up. Last edited by raygr; 04-19-2007 at 10:16 PM. 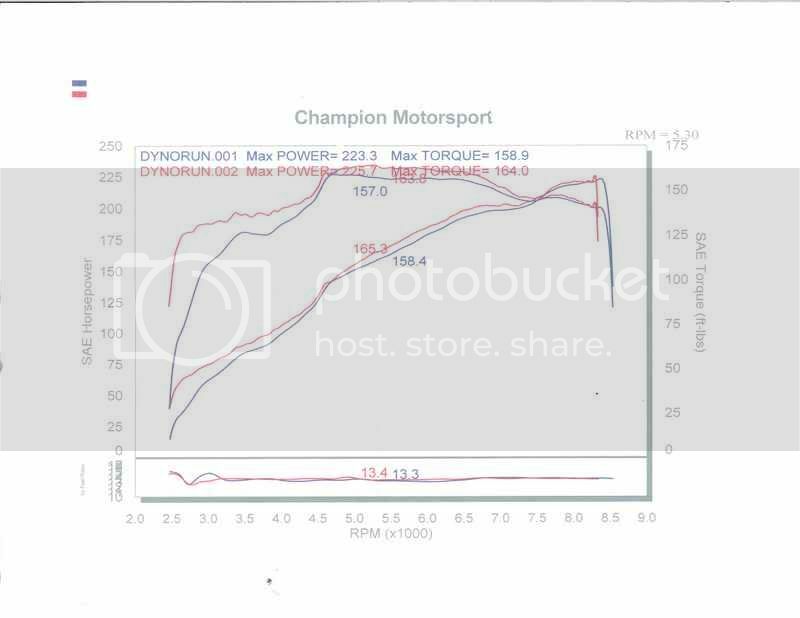 Here is a comparison of my N/A Exige with the Exige S (from the same dyno shop). N/A Exige: Larini exhaust, Daytona intake, ForcedFed headers, ForcedFed sport-cat. Last edited by raygr; 04-20-2007 at 02:56 PM. what mods does each car have? It looks like the variable cam switchover point under these conditions is about 4500 RPM on the S.
How so? Are you referring to the N/A Exige run? That dip is the cam switchover. Thanks a lot for posting! A 40 HP difference!!! you have the stock cat on there? I'm going to try to have mine done still. I've only done the desnorkel/funnel mod. Still haven't put on my exhaust yet. I want to know what has been done to the S to get 220 WHP! that's about 30 HP more than stock, no? Charlie, any thoughts on the shallow torque valley in the 7,000-7,700 range? It's very consistent run to run. The A/F and boost (as ragged as the measurement is) doesn't seem to be a cause. Timing pulled for some reason maybe? Or a result of intake/exhaust resonance? Last edited by funS111; 05-09-2007 at 07:23 AM. Lower map is last season before I ported the head. Exige S, Larini Exhaust, FF street headers & cat, ReVerie Daytona Intake, Shell V-Power 92 gas. This compares my best run w/o the headers with the best run with the headers. The best run was obtained by spraying compressed air into the roof intake to cool the charge-cooler. Intake air temp went from 85 deg F to 123 deg F in 1 pull! I'm concerned now that it is too lean. We may install larger injectors. Last edited by raygr; 05-11-2007 at 10:44 AM. dynosaur! now that is funny. what do you mean "mysterious reflash?" 05 Elise, 7000 miles, all stock. Dyno measures at the hubs, so expect a higher reading than an inertia dyno. The lack of go between 4500 and 6500 rpm is apparent.